Coach Amy embraces Scarlett after a successful bike leg at Ironman 70.3 Ohio. Roadie is a term cyclists use affectionately to refer to their road bike. It’s designed for the open road and more stout than a triathlon bike. Some triathletes have one of each and use their tri bike minimize drag in a race. New to the sport, I opted to stick with my roadie for the 56-mile long Half Ironman course. I wrote this blog to inspire those chasing a dream, taking on a challenge or facing fears in this amazing ride we call life. I met Scarlett two summers ago. Our relationship was tentative at first. Every week I saw posts on Facebook of triathletes lying in hospital beds, unrecognizably swollen and bruised with broken bones or missing teeth after bike accidents. Worse were the stories of athletes who didn’t survive their crashes. I was terrified, so Scarlett waited in the garage for months collecting dust until I had the nerve to take her for a ride. We started our journey in a parking lot where I clumsily managed to clip my shoes in and out of her pedals and fumbled to control her gears. The first time I placed her on a resistance trainer, the smell of burning rubber began to circulate in the room. Ensconced in haze of smoke, we listed to the right in a slow, awkward fall to the ground in front of a room full of experienced triathletes . In order to save our budding friendship from further disaster (and embarassment), I consulted with bike expert, Mike Irwin. He showed me how to change Scarlett’s tires, set her up in the trainer, and work her gears. With his fine tuning and adjustments, Scarlett and I fit perfectly together. A summer later and one sprint triathlon race (10 mile bike leg) under our belt, we set about training for our first half Ironman. Many nights after work we sat for hours in the trainer glued to one spot and powering nowhere. I imagined Scarlett was a horse and instead of a room, we were running in a large field towards the smudge on the wall in front of us; the smudge became a mirage of a red barn. On Sundays, our scheduled workout was usually outside on the road. We escaped the sweet aroma of donut shops, oversized SUV’s and the texting drivers of suburbia to the Kansas countryside with rolling hills lined in cornfields, fewer drivers and only an occasional stop sign to slow us down. With each ride, we became a stronger team. Scarlet remained cool when I lost my temper at reckless drivers. She was steady when I threw tantrums or broke down crying in a bonk because I failed to hydrate or eat enough. When our Coach made us slow down because “The bike is all about fueling and saving it for the run,” we commiserated in our frustration, but agreed to concede. Once, we took a 62 mile pilgrimage in 102 degrees around the shadeless 3.5 mile airport loop with a vicious headwind that seemed to change direction against us at every turn. We discovered our grit, stamina and mental toughness that day; we finally had what it takes to complete a half ironman. On race morning, after completing the swim (see The Long Swim), I ran up the hill from the beach, rounded the corner, and headed straight for Scarlett. Dutifully, she was right where I left her. I threw on my helmet, tucked nutrition into my kit, stuffed my feet into my shoes, and lifted Scarlett free. I ran her to the road and once astride, we became one. Itching to go fast, we begrudgingly held back as our Coach instructed, even as we were passed by riders on fancy tri bikes with their aerodynamic bars and high performance, carbon fiber wheels. One such rider sported black shorts with large white letters printed on the rear. “JUICY”, it read. As instructed, I let him go and kept my heart rate down, ate, drank and settled in. I scanned for pot holes while we jockeyed for position in congested race traffic. We held strong, winding through long valleys of soybeans and corn fields. We waved at spectators and thanked volunteers. This was not loops around the airport; this was fun! Occasionally, we passed riders stranded on the side of the road with flats or other mechanical issues. Some gave up with hands on their hips shaking their heads. Others worked furiously making repairs to get back in the race. With a heavy heart for their defeat and hopes they would soon recover, we pressed on. Miles passed quickly and at approximately 40 miles, I spotted a red barn. It was just like the one I visualized on my wall at home many months ago! We surged towards it, bridging gaps and pulling away from tri bikes; angels were getting wings! Two miles from the finish, we were still strong. I was energetic, well hydrated, and growing giddy with excitement for the upcoming transition when Scarlett made an ominous sound as though a small rock was bouncing around in her gears. "Oh, No! Come on girl. Hang in there!” The rock flew loose without noticeable damage. Ironman 70.3 - Ohio. 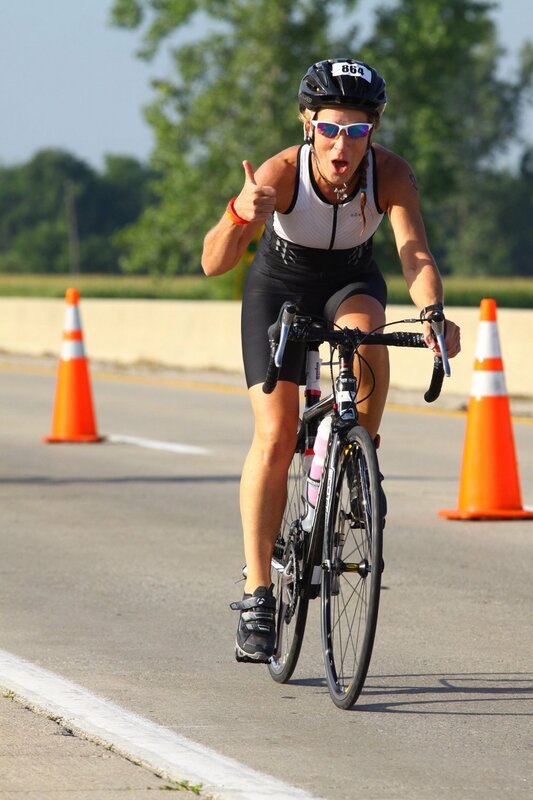 Coach Amy has fun with the professional photographers on the bike course. Bike Stats from Coach Amy's Garmin Forerunner 935.